In 1999 a Legionella disaster occurred in the Netherlands. Lot’s of people suffered from the Legionnaires’ disease. They got pneumonia-like symptoms and the disease was spread over the country. 206 people were in a critical condition, 32 people died. Probably more people died because of the disease before a diagnosis was even made. All patients visited the Westfriese Flora, the biggest yearly indoor flower exhibitions of the world. The event was held from 19 until 28 February in Bovenkarspel and attracted lots of people all over the Netherlands. All the people who got sick visited the exhibition after the 22nd. Researchers found that the source of the disease was concentrated in pools at the Westfriese Flora. The indoor pools were part of the exhibition. The pools were filled with water from an old fire hose, which was not used for a long time. No bleach was used, as people were not supposed to go into the water. Present in the stagnant water inside the fire hose was an aggressive variant of the Legionella pneumophilia bacteria, which cause the Legionnaires' disease. For doctors, it was difficult to come up with a diagnosis. The Westfries Gasthuis in Hoorn, where the first patients were located, asked the help of the AMC in Amsterdam. The AMC discovered patients were suffering from Legionnaires' disease. It took a while to link the Westfriese Flora with the disease, as people did not get ill immediately after the exhibition. On the 13th of March, the Netherlands National Institute for Public Health and the Environment gave all doctors and hospitals a warning of the epidemic. Children and older people were part of a risk group and had a greater chance of getting in critical conditions. The disaster raised several questions. Who was to be blamed for the disaster how does he need to be punished? News articles are still published about the disaster, as there are several problems with the insurance for the victims. Lot’s of people have chronic complaints and notice the consequences of the disease in daily life (Velzen 2006). After the Legionella disaster, some people established a foundation called ‘Stichting Veteranenziekte'. People from all over the world who have suffered or suffer from the Legionnaires' disease joined this foundation. Professionals offer help to victims and victims can get in contact with each other. Stiching Vetaranenziekte helped to create a monument for the disaster. It was difficult to find the monument of the Legionella's disaster. On the Internet, I couldn't find an address where the monument was located. I did find an address where the disaster happened, but when I arrived there I didn’t saw a monument. It was hard to tell that a disaster ever occurred in this big container in an industrial area. No flowers or photos were put to remember the disaster. The big container was shut with a high fence, but I could see people working behind it, so it was still in use. I decided to go to the central shopping centre and to ask people if they knew about the disaster and the monument. The first people I spoke to were a middle-aged couple. They knew the disaster happened and that a monument was built, but they just moved here and didn't know where it was put. I asked two old ladies who were shopping together. One of them responded immediately. She knew what had happened and gave me directions to find the monument. The monument was put at the side of a railway in Bovenkarspel. The environment on both sides of the monument, next to the railway, looked like an elongated park, with grass, trees, flower beds, picknick tables and a sandy walking path. Parallel to the railway, on the side of the monument, a sidewalk and a road were situated. The houses at the side of the street looked old, but not far away was an area of new buildings. The monument counted two parallel entrances, four benches en two rubbish bins. The entrances were connected with the sidewalk. One was located facing the open book on the left side, the other on the right side. It wasn’t possible to walk into the monument without using the entrances, as the rest of the area was covered with a hedge. Two benches were put on the side of the hedge facing the open book, with two rubbish bins between them. The other two benches were put in the two corners of the rectangle, at the same side of the open book. It's remarkable that the two benches who faced the open book had a back side, the other two in the corner had not. The monument was full of nature. The second and third flowerbed, from the side of the entrance, contained both a tree. The flowerbeds didn’t have the same flowers, but they shared some colours like purple and blue. Trees were sticking out of the hedge. Between every tree a metal stake was put, to stick the branches of the trees together. As a result, the tops of the trees were woven together as a sort of hedge. Behind the hedge on the left side of the open book, a weeping willow was situated on the waterside. The monument felt like a protected zone. It was all covered with a hedge and willows. I’m not sure why they choose for the big open book statue, but the text on the left side and the poem on the right side have certainly to do with the disaster. The text was written by the Stichting Flora Veteranenziekte themselves and shows how many people were affected by the disease. The lines also explain the purpose of the monument; a comfort zone where people can think and rest. The benches with the back side and rubbish bins were on purpose facing the open book so people could sit there for a while. I think the flowerbeds stood symbol for the flowers who were exhibited at the Westfriese Flora where the disaster occurred. The woven willows gave a feeling of understanding, a feeling of coming together to remember the disaster we all experienced. For me, the weeping willow behind the monument was also part of the monument, because this tree is a symbol of mourning and sorrow. The poem on the right side of the open book goes about the wish to get someone next to you who is dead. This makes perfect sense in the context of the Legionella disaster, but the poem was not written for the disaster. The poem was written in 1966 and the writer died in 1997, so she died before the disaster happened. The writer also has nothing to do with the place where the disaster occurred; she was not from that neighbourhood. I wonder why they did not use a poem that had more to do with the disaster. I think if they did, the poem had a stronger symbolic value towards visitors. The environment where the monument was located appeared a bit strange for me. The monument was not close to the container where the disaster happened. It was also not close to the centre of Bovenkarspel. Instead, the monument was situated close to an area of new buildings at the side of a railway. Looking at the purpose of the monument, it's a place where people can think and rest doesn't make sense for me at the side of a railway. Every fifteen minutes a train was passing by with lots of noise. The street side, on the other hand, was very calm, not many cars passed by and it looked like a quiet area. The elongated park on both sides of the monument gave also a feeling of rest with the picnic tables, nature, and sandy paths. I think it was better if they had put the monument in a more public spot. Now it is almost as if the monument is hidden and in a sense, the disaster is put away as the monument is so hard to find. I think that people will always find peace at the monument, no matter if it's in a crowded area because the hedge with the woven willows is strong enough to give people the space to isolate from everyday life. I wondered if people visited the monument. When I arrived there I was alone. The monument looked clean, but not fully maintained. The flowerbeds were neglected, bird droppings were found on the benches and the pavement was a bit caved in. The hedge with the woven willows, on the other hand, looked like they were taken care of. I found some trash in the rubbish bins, a sign that the monument was still in use. The trash consisted of empty beer cans and crisp bags, so I think that some young people used it as a spot to relax. I doubt if they were there to stand still by the Legionella disaster. No lights were put at the monument, so there was no light at night. On the Internet, I read that in February 2014, the mayor of Bovenkarspel in cooperation with Stichting Veteranenziekte had put flowers on the monument of the Legionella disaster. So 15 years after the disaster, the monument has still an official function. 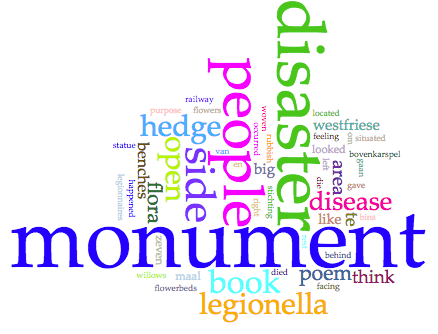 The monument of the Legionella disaster had strong symbolic relations with the disaster. The text presented on the big statue of an open book tells the visitor about the impact of the disaster. The poem on this same statue doesn't have a direct relation to the disaster, but it fits well in the context of the victims. The flowerbeds are symbols for the flowers that were exhibited at the Westfriese Flora, the event where the disaster occurred. Even the weeping willow, which is strictly not part of the monument as it is located behind the hedge, has a symbolic value. It stands for mourning and sorrow, feelings that are strongly connected with the Legionella disaster. The purpose of the monument is explained in the text on the open book statue. The monument is built to give people a place to think and rest. This is expressed by the benches and the rubbish bins, as it gives visitors the possibility to stay a while at the monument. The hedge and the woven willows give a feeling of protection and comfort. These are high and strong enough to give people the space to isolate from everyday life and to stand still by the disaster. The monument after fifteen years still has an official function in the remembrance of the Legionella disaster.